I'm really bad with diets. Really. Bad. Like... I can't recall a diet that I've ever been successful with. Not because my memory is poor but because, literally, I don't think I've had a diet last more than a week. Wait, I take that back... there was one semi-diet that worked but... if I'm honest with myself it wasn't really a diet. I gave up soda for a year and was successful... but I think most people would agree in that it wasn't a diet. So... here I am, 10 lbs away from losing all the baby weight and at the start of a new diet. A diet that I've already failed at. Siiiiiiiiiiiiiiiiiiiiiiiigggggggggggggggggggggggggggggggggggghhhhhhhhhhhhhhhhhh. I found a diet that I thought I could do and started it on Monday. Well, I planned to start it on Monday. However, when I woke up Monday morning I didn't have the stuff to start the diet and had to get to the store but I wasn't able to get to the store until later in the afternoon and let's face it... if you can't do a diet in the morning there's no point in doing it later that day. Now Wednesday rolls around and I'm determined to be good. And I was pretty good... until I ate a piece of by bread. Why did I eat bread? I'm weak and I hate myself for it but it was tempting me on top of the fridge. It called to me saying "Victoria! Eat me! Roll me up into little balls and eat me under the guise of feeding it to your child but for every one you give him you eat 10." See what diets do to me? They make food talk to me. Thursday started and I really wasn't even pretending at this point to want to diet but I stepped on the scale and thought, "I can do this!" And for 10 minutes I really thought I could and then my children both woke up with fevers of 101 and I laughed while I ate my cereal and eyed Sawyer's starbursts. Friday Sawyer and Beckham both still have fevers and are short on their tempers and I feel a tickle in the back of my throat as I feel the cold spreading it's cold tentacles to me. Diet? No, I've moved on from Sawyer's starburts to his popsicles in the freezer. Saturday, not only have I depleted all of Sawyer's potty treats but the kids are still sick and Beckham is now coughing like a 72 year old man. So do you want to know what I did? I pushed all of my diet food to the back of the cabinets/fridge/freezer and replaced them with starbursts, popsicles, ice cream, pop, frito chips, bean dip and chocolate graham crackers. Diet fail. So here I am, Sunday, my kids fevers are gone, I'm feeling semi-better and most of my Saturday binge treats are gone and with a new resolve to do this diet starting tomorrow. I should be able to do this. I know if I did it for a solid 4 weeks I would be good. So we will see. But if I never post again... know that I failed. Potty training. That deserves the ultimate sigh. I determined it was time. Sawyer is 2 1/2 and I've been ready for 2 years for him to be potty trained. I actually bought a toilet seat for him a couple months ago and tried but he didn't seem very enthusiastic about it. Plus, I was only giving him a couple skittles when he did it and I think he determined it wasn't worth it for that. Now I have a "treat" bowl full of fun size snickers, milky ways, dum-dums, hershey kisses and life savers. Whenever he goes he gets to choose which one. He seems much more excited by this. In fact, the pee side of things has worked out pretty well. We've been doing it for about a week now and half the time he goes in by himself and the other half I remind him it's time to go. The only problem is that throughout the day he decides it's time for a treat and runs to the bathroom and squeezes out a few drops and thinks that is treat-worthy. No, it's not. It was cute at first and now it's just annoying. Especially because he thinks I need to drop everything I'm doing so I can see him get two drops. No, that side is working out great. It's the other side of the business that isn't going so well. Sawyer does "his business" pretty early in the morning. Either before he wakes up or right after. So if it's before he wakes up then it's just tough cookies on my part. If he hasn't and I try to get him to go it's like pulling teeth. One thing Sawyer has been consistent on is waking up pretty grouchy, or waking up happy with the potential to go grouchy in 1 second flat. So, we're still working on it. I was happy to continue with things as they were but this morning made me change my mind. I thought I was going to catch it this morning, you know... before he did his business. I put him in his training pants and we were all set to go. I was asking if he needed to go every 5 minutes and then he decided that inbetween those 5 minutes he was going to get busy.... REALLY busy. Disgustingly busy. Now I'm stuck with these dirty training pants and what to do with them. I was really tempted to throw them away but then that leaves me with less of a supply. But where to wash them? I remember what my mother told me... in the toilet. So now, I'm standing in front of the toilet, holding dirty underwear, looking at the toilet and trying not to gag. You think I'm gagging because of the underwear? No. Poop doesn't disgust me.... well, at least not to the point that I gag. It's the toilet. Toilets are gross. Is that weird that they disgust me that much? Especially toilet water. The thought of having to rinse this underwear in the water makes me want to cry. I did it, i'm not happy about it but I did it. Yes, I'm alive although it was questionable at points if I was going to make it. But I feel tainted. Like... will I ever fully recover from this? Time will only tell. So now I'm determined to never have to go through that experience again. Tomorrow, if Sawyer wakes up and hasn't done his business I am going to sit him on the toilet and he isn't getting off until he's done. Be it 5 minutes or an hour, I am determined. Well, determined until Beckham wakes up... then I'll probably slack off. So last time I posted was right around Thanksgiving. So that means I've missed a few critical posts about the holidays. No worries, I will post a super extra long post about all the fun you missed. Ready? Big breath............ stuff happened. Ba ba bum!!!!! Pretty amazing, yes? You wanted more? No? Oh good, I'm too tired to remember what happened past yesterday. Tired... that's my new existence. I've never been so tired in my life as I have been for the past 3 weeks. Beckham decided sleeping wasn't his thing. No joke, he wakes up 4-5 times a night. That means he wakes up every 1 to 2 hours. Yes, that's right. Want to know what it's like to watch yourself going crazy? Try this sleeping schedule and you'll find out real quick. Oh, let's also include that he's trying REALLY hard to not take naps. I know people - that includes doctors, blogs, medical websites, your sister, your friends, your mother - all tell you that it all passes in time but in the moment it's much easier to contemplate what life was like before you had kids. It's hard since for over two years now my life has, literally, revolved around raising my children. I know I used to go to movies past 7 o'clock but it's hard to understand why. I used to only know one or two shows on the Disney channel but now I not only know every show I also know what time they come on, what order and when the specials will be on so that I can DVR them for later. Before children I could leave the house before 8 o'clock and it was no big thing. Now, if anyone asks me if I can be somewhere before 11 I think they must be insane. Let's not mention that to actually leave my house now it takes at least 30 minutes to pack up my kids and get them in the car. Making dinner used to be easy. I used to have single friends but half of them left when I got married and the rest ran away when I had a kid. Not that I'm really lamenting the loss of not having single friends... drama tends to follow them a bit more. I like to get my drama from Project Runway, thank-you very much. I used to be able to read books. Now I only read books that involve bears and big red dogs. But most of all, I used to think I could have 6 children <insert maniacal laughter> Yeah... let's rethink that one. I am not a perfect parent. Far from it in fact. I think a lot of people are afraid to admit that. Actually, I don't think people are afraid to admit they're not perfect but they are afraid to admit they do things they shouldn't. Not me, I'll lay it out for you. On several occasions Sawyer has had a popsicle before he's eaten breakfast. Why? Because it's what he's want and I'm preoccupied with other things. Does that make it right? No, but it happens. 75% of the time I go to Walmart/Costco/Any store at all, Sawyer comes home with some type of treat or toy. I give lollipops to my kid to shut him up keep him quiet. Sawyer has watched several movies in a row plus a few episodes of jake and the neverland pirates. What am I doing? That's none of your business. If we stay at home all day Sawyer is probably still in his pajamas or only in a diaper. I probably am too... not the diaper of course. He eats in front of the TV. I let him color with markers... *gasp! * ... and yes he has drawn on things he shouldn't. I've let him him 5,6,7 gogurts in a row. Bedtime is when we've decided we've had enough of him. Now all of this is only Sawyer, we'll leave Beckham for another day. Sawyer doesn't like to ride in grocery carts anymore which I don't mind as long as he stays with me. Do I have to explain how hard it is for a 2 year old to stay with his mom, especially in Walmart at Christmas time where it seems like there is a toy placed every 10 feet? Well, I've found that if I offer him a lollipop, as long as he stays in the cart, he's a happy camper. So yesterday we were finished shopping and on the way home and he still had his lollipop. I had grabbed a banana because I was hungry and he saw me and wanted one too. However, he still had the lollipop and the only place for him to put it was on the seat, on the ground or in my hand. I didn't want it to I told him he had to finish it before he got the banana. Does that make the statement seem any better? No? Well, let me ponder that while I go get my son a bowl of ice cream and sit him down to watch Jake. I knew I would do this. My last blog post was over two weeks ago and I've really had no motivation to write another one. I even made this adorable wreath, and as we've seen in posts past I'm pretty proud of my craft accomplishments, and I didn't even take a picture of it. Well, that's not true... I did send a picture to my mom and sister so they could be jealous of my awesome new wreath. Don't worry, they are... they were all like "oh Victoria, you're amazing! How do you do it? Can you make me one? I'll pay you 100 dollars!" That whole conversation may have happened in my head but with two kids distracting me, I can't be sure. So now I bet you're all like, "Victoria, you made a wreath! I bet it's way cool, at least as cool as your Halloween one! You should show us a picture!" Well don't worry adoring fans, I will ease your troubled souls and show you my amazing new wreath. Now, remember to ignore that ugly grey door as it's basically the worst backdrop for this really amazing wreath. Jealous much? No? Oh, well that doesn't change the fact that I still really like this wreath. Plus it only took me 2 hours to finish and it gave me a reason to finally buy a glue-gun. A glue-gun that Sawyer was eying pretty greedily the other night so I've stashed it somewhere he'll never find it. The only sad thing about this wreath was that I had to put my Halloween wreath away. And speaking of Halloween I bet you're now saying to yourselves, "Hey, doesn't Victoria have two adorable children who would've looked adorable in Halloween costumes?" and to that I would have to say, "You are correct, dear sir!" Here's my adorable tiger who wouldn't keep his head on. We went trick-or-treating with his two cousins out in Boise. Parker, the monkey, was born on the same day so the two have them are always fun to get together. Then there's the Princess Brooklyn who enjoys being the ring-leader of the bunch. Beckham was the cutest Giraffe you'll ever see. I think he was a little scared of being a giraffe but I'm all for stuffing cute things into a cute thing to make a doubly cute thing. Now, the parents of these two children didn't quite achieve the level of cuteness that our children can. What's that? You want to see... alright, but just remember that these were Halloween costumes. Laughing? Well, it's well deserved. And don't worry, I'm very aware of how well this costume looks on me. Chris made it very clear that I was a very good nerd, scary good. Like... this could be me on the inside and I'm just really good at hiding it. Siiiiiiiiiiiiiiiiiiiigggggggggh.... what does it say about me that a nerd costume is very suiting? I don't want to talk about it. One thing you can say about Chris is that he's always entertaining. One of the reasons I married him so I must say that I've enjoyed this entertaining quality of his for the past five years. Always on the lookout for the next thing Chris discovered that Zion's bank was having a competition to find the "cheapest" person. After narrowing it down to 10 finalists they then compete in a web series to win 10,000 dollars. So, in true Chris like fashion, he's sitting in class when he comes across this and decides he's got nothing to lose. Well, he made it to round 2!! So yesterday we spent the little time we had together, between school and meetings, to film a 60 second video. Here's the unedited version since it's a little funnier. The beginning is a bit boring but make sure you watch the whole thing since the end is much funnier... I mean it's only a minute long, what else do you have to do with your time? So, as from the title of this post, I am going to be delving into another pinterest project. However, before I do that I need to announce that Beckham is smiling!!! He's been doing it for a week now but I FINALLY was able to get the timing right and snap a picture. There's nothing like having your baby smile at you to form an instant bond. No matter what you feel for your baby before that moment (hopefully it's love) everything changes when you get a smile. How goofy is that smile? Loooove it! I was so happy when I got this picture because when I pressed the button it was a much smaller smile but in the second it took my camera to focus he whipped this sucker out. Looks like I have a poser. For the record, I'd like to point out that he is smiling early. So basically, what this means is Beckham is a genius and will probably solve world hunger, cure cancer and become president all before the age of 5. I don't care if you can't become president until your 35.... Beckham will smile and they will change the law. Besides, he already has his presidential pose worked out. Don't believe me? I'm pretty sure that he's dreaming about the masses cheering at him with adoring faces. And he's all like, "Ugh, it's so tiring being this loved." Well, baby or no baby, pinterest projects must be completed. 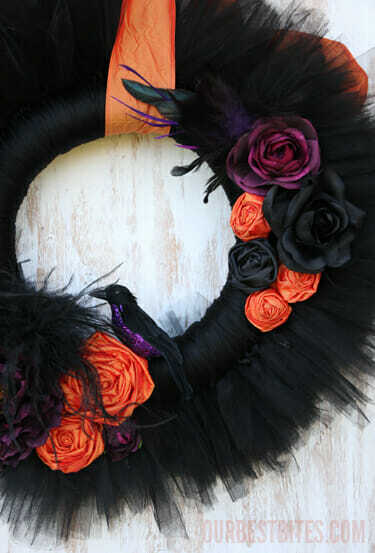 And since Halloween is coming up I thought it would be appropriate to make a Halloween wreath. This past weekend we stayed at my in-laws since Chris's brother and his fiance were going to be in town. And it's probably pretty important that I actually meet my future sister-in-law and give my approval. Because, as we know, my approval is puh-retty (un)important. But, I also figured this would be the best time to get a project done since I'd have helping hands. At least with Sawyer because, as you will see, newborns are fun to oogle at but not hold. Yes, Beckham decided that he only wanted to sleep if he was being held so I obliged but didn't let that get in the way of my crafting. What you can't see is that this is a three person couch and I'm taking it all up with my supplies. In the course of me making this wreath several people walked into the room looking for a spot to sit and I decided to keep my eyes squarely on my project as to avoid that awkward situation. I wish the door wasn't such an ugly metal gray but I can't help that. But look at that awesomeness!! I wanted to throw in some color since it is Halloween and how can you not use orange and black? Love the spider too... the only time in my life I will ever say that since spiders are devils incarnate. I have to admit that I'm a little scared to put this on my door since I fear it might get stolen. I mean... if I walked by an apartment with this on it... I would take it. Be warned, if I'm ever your neighbor and decorations go missing... I took them. I'll deny it... but it was me. The Powers of Observation Have Arrived.